Innovation LED is a leading UK manufacturer of custom LED lighting solutions with clients spread across the globe. Based in Oldham, Innovation LED is the world leader in the design and production of custom lighting solutions with proprietary technology. With clients ranging from music events in Las Vegas to working with leading designers in Tokyo, Innovation LED has been expanding their range of products and needed a website that could grow with them. Throughout the process, we were impressed with how flexible The Artlab were and how easy to deal with, which was fundamental to us. We are very happy with our new website which serves as the platform for our company to expand into new international markets. To support Innovation LED with their international expansion, we designed an innovative, custom WordPress site that could be both easily edited by Innovation LED staff and allow for new products to be added as they became available. We take our international SEO seriously. We worked with Innovation LED to help identify target markets and provide the necessary SEO features and best practice settings for those regions. We craft custom, hand written code that is fast and reliable. Using the latest technologies and processes, we ensure that our Wordpress sites follow best practice guidelines and do not rely on third party plugins for base functionality. In other words, our sites are built to last. It’s important to us that our clients are able to make the necessary changes to their websites as they arise. 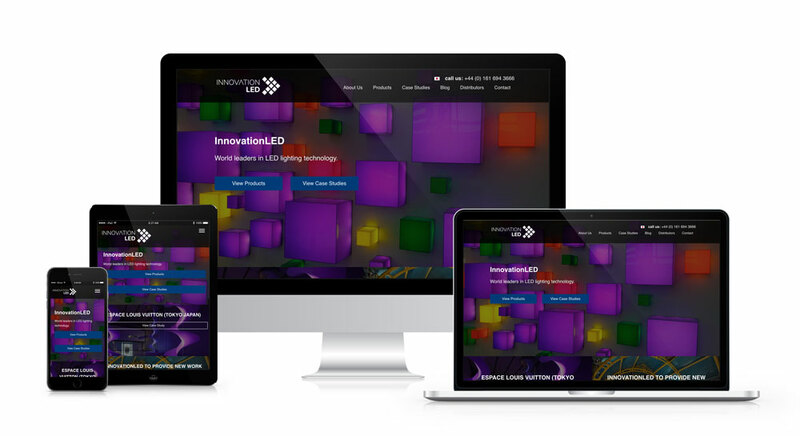 We invested additional time into Innovation LED’s website to create a backend that was user-friendly and easily editable. We optimise our sites to load as quickly as possible. We do this with lightweight, custom code that is optimised for delivery. As such, Innovation LED’s website tests 90 or above on mobile and desktop in Google’s testing tools for the majority of its pages. Innovation LED’s product offering is geared for expansion. We designed a custom product layout that works for Innovation LED and allows for simple additions of new products. Based in Trafford Park, we specialise in building high performance websites for manufacturers and other industries that are optimised for search visibility. We’d be happy to discuss your next web project.